Test Prep. 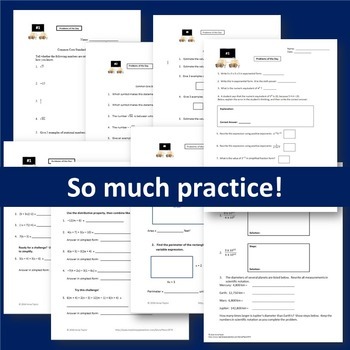 8th Grade Practice Pages Bundle! 5 Weeks of bell work...done! Rational, Irrational Numbers, Systems of Equations, Exponent Rules, Scientific Notation, Distributive Property. Save 30% with this purchase! *Test Prep: Reinforce skills taught throughout the year. *A week of bell work = 1 day of Emergency Sub Plans. 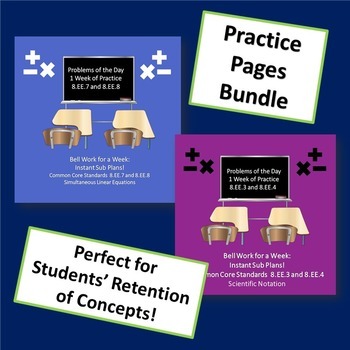 So you've got 5 full days of sub plans with this bundle! 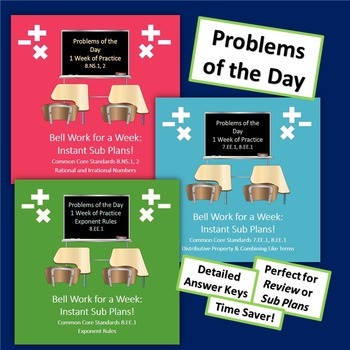 *The Detailed Answer Keys will make this perfect for subs and tutors! The above resources are also included in my Whole Pi Pre Algebra Growing Mega Bundle. Check it out for some awesome savings! Thank you for purchasing and leaving feedback! Did you know that you can earn TpT store credits by leaving feedback on my products? Go to the "Buyers Handbook" on the TpT site to learn how to redeem your credits on future purchases. There’s more… If you go to “My Purchases” you will see a list of what you’ve bought in the past. Click the “Leave Feedback” button and you can still earn store credits for your past purchases! Look for the green star next to my store logo and click it to become a follower. Voila! You will now receive updates about this store. Please honor the time and effort put into this product by not giving it away to others. Your purchase allows you to return to your purchases page at Teachers Pay Teachers to purchase additional licenses at a reduced cost for your colleagues.